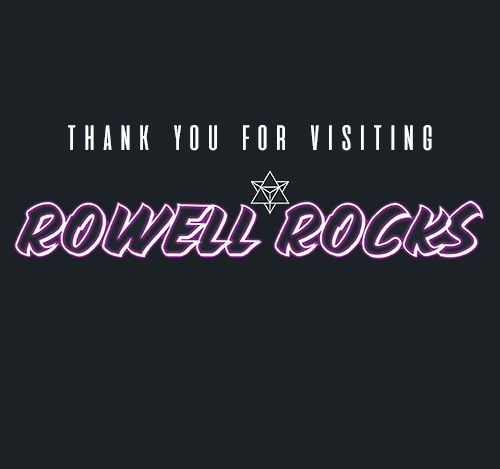 Welcome to the website (the “website”) of The Rowell Rocks. On this website, we may make available to you a wide range of information, products, downloads, documents, communications, files, text, graphics, publications, content, tools, resources, and services. All materials contained in the website are the copyrighted property of ourselves, our subsidiaries, affiliated companies and/or third-party licensors. All trademarks, service marks, and trade names are proprietary to ourselves, or our subsidiaries or affiliated companies and/or third-party licensors. You also will choose a password and a username. You are entirely responsible for maintaining the confidentiality of your password and account. Furthermore, you are entirely responsible for any and all activities that occur under your account. You agree to notify ourselves immediately of any unauthorized use of your account or any other breach of security. We will not be liable for any loss that you may incur as a result of someone else using your password or account, either with or without your knowledge. However, you could be held liable for losses incurred by Ourselves or another party due to someone else using your account or password. You may not use anyone else’s account at any time, without the permission of the account holder. You acknowledge and agree that certain services may provide password-restricted access to customer information such as names and certain terms of your contracts. By using this website and registering for such services, you consent to our display of such information via the services and accept all risks of unauthorized access to such information. If you provide any information that is false, inaccurate, out of date, or incomplete, or we have reasonable grounds to suspect that such information is false, inaccurate, not current, or incomplete, we may suspend or terminate your account and refuse any and all current or future use of the services or any portion thereof. You are responsible for all costs and charges, including without limitation, phone charges and telecommunications equipment, that you incur in order to use the services. As a condition of your use of the website, you will not use the website for any purpose that is unlawful or prohibited by these terms, conditions, and notices. You may not use the Services in any manner that could damage, disable, overburden, or impair any of our servers, or the network(s) connected to our servers, or interfere with any other party’s use and enjoyment of the website. You may not attempt to gain unauthorized access to services, materials, other accounts, computer systems or networks connected to any connected servers or to the website, through hacking, password mining or any other means. You may not obtain or attempt to obtain any materials or information through any means not intentionally made available through the website. Payment may be made Sagepay on our website and will be debited when we receive your order. You will be charged the current price for buying goods from our website at the date you place your order. All prices are displayed on our website and are inclusive of VAT, where applicable, at 20%. We reserve the right to amend prices if there is a change in the rate of VAT. We do our best to make sure that prices are correctly shown but very occasionally an error may occur. We will do our best to correct errors and omissions as quickly as practicable after being notified of them. However, because of the technology that is required in operating the website, there may be times when obvious errors occur. For example, very occasionally, this may result in a price, or product or other detail displayed or presented on the website being incorrect. In this case we reserve the right to cancel that contract, but this of course will be without any liability to you. If this should happen, we will correct the price and ask you to confirm whether you still wish to purchase the goods at the correct price. Rowell Rocks wants to make sure you’re satisfied with your order, if you have any questions or concerns please email – info@Rowelltrading.co.uk and we will get back to you promptly. All sales are final. Returns will not be accepted due to buyers remorse. Please, if you have a problem with your order regarding damages, notify Rowell Rocks within 3 business days of receiving your shipment as we will try our best to figure the situation out and we will try our best to determine a resolution. Once the grace period has been passed, the item can be fixed upon request. If an items return is approved, any approved returns are subject to a 20% restocking fee and will not include the original shipping costs. Buyer is responsible to pay shipping costs for any approved returns. Here at Rowell Rocks, we understand that our customer’s need a little help from time to time, hence why we do not charge a minimum order. Allowing you to feel more relaxed when shopping with your money. Postage cost is a flat rate of £8.50 on all orders under £150.00 excluding V.A.T All orders above the £150.00 mark comes with free carriage. On all orders under 2kg, parcels will be sent out by Royal Mail and will be charged at cost. The overseas carriage is calculated upon application. If you would like to: access, correct, amend or delete any personal information we hold, make a complaint, or simply want more information please contact us via info@rowelltrading.co.uk Or via post at Rowell Rocks, Unit 13i Albion Mills Albion Road Greengates Bradford West Yorkshire BD10 9TQ.